Talk N’ Text subscribers can avail more Talk N Text Mobile Internet, Facebook and UnliSurf Promos that will suit your budget and lifestyle. Need to chat your friend? Access e-mail from your phone? Get the latest updates on your favorite social networking sites. 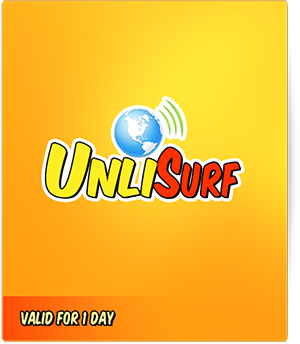 Mobile internet surfing has been made more affordable for all Ka-Tropa from Pisonet up to unlimited surfing on your phone. You have more reasons to connect with your loved ones and keep posted on the latest happenings on your Facebook and Twitter accounts. Enjoy 10 minutes of Facebook access (with a cap at 1.3MB of data). *watching videos is not advisable due to faster consumption of data. Enjoy browsing your Yahoo! emails and even use you Yahoo! messenger via mobile browser for only Php15. Enjoy Unlimited Mobile Browsing for ALL Sites! for one (1)! valid for only Php50. 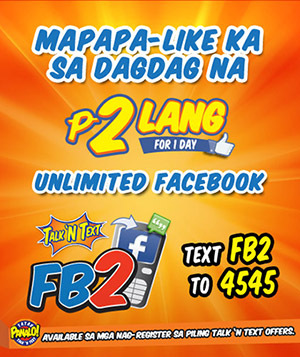 If want to learn more about Talk N’ Text Mobile Internet, Facebook and Unli Surf Promos, simply visit in Talk N Text website (www.talkntext.com.ph) or you can visit Talk ‘N Text Communications Facebook page for the latest updates. When po ba ang promo expiration date ng SAMPLE? Ba’t hindi available ang pisonet sampler?